Women get a bad deal when it comes to collaborations. If they’re not being sized out the game and blanked entirely they get given something so token that they may as well have not bothered. The Year of the Snake AM1s early last year were a break from that and the New Balance and X-Girl MRT580XG goes in. Those with a long memory will recall X-Girl hype back in 1993, with the brand operating as a spinoff of the Beastie Boy (via Mike-D) affiliated X-Large line. Having Sonic Youth’s Kim Gordon involved alongside Daisy von Furth and with cool kids like Sofia Coppola as part of the crew, X-Girl was one of the few street wear lines serving the ladies correctly. By 1996 it seemed to get less coverage and then X-Girl was sold to a Japanese company around 1998. When brands get acquired in Japan, they don’t mess around. X-Large is still alive and kicking in Tokyo and X-Girl has followed its own path out there too (though it got relaunched in the western world a couple of years ago, with a spot of hype around it). The New Balance MT580 was always a real curiosity — what looked like lovechild of a couple of models from the late 1990s was a collaborative darling from 2000 onwards with mita at the helm. Like X-Girl at the time it was the kind of thing you’d only clock on a trip to the Far East. 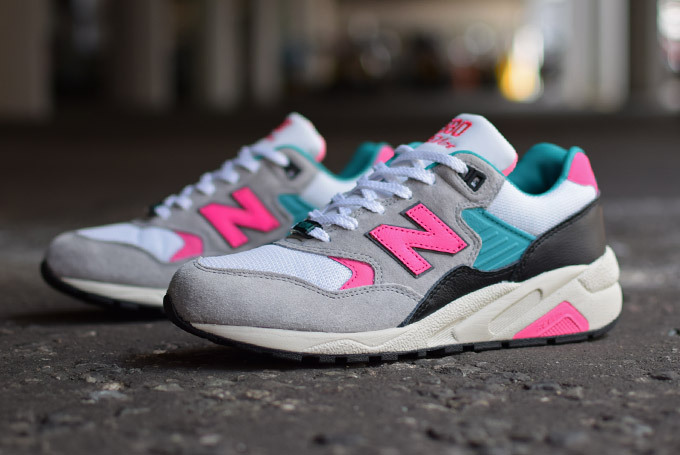 X-Girl have worked with New Balance before, like 996s in association with atmos and some 710s. They weren’t as good as these shoes. The MRT580 edition of this silhouette that switched the Rollbar for REVlite had us mean mugging when we first saw it, but you can’t deny the feel of that thing. Those colours could be written off as South Beach-alikes, but we think these are more akin to the palette used on early 1990s masterpieces like the New Balance 850. From the suede to the soft garment leather on that tongue everything’s been considered here — custom laces and lace jewels all come correct. Anybody with big feet is going to be disappointed here, but the target audience won’t be getting the blues. We would wear these in a heartbeat if they fitted.